On the Prairies, the wind can be your best friend or your worst enemy. I’ve experienced both. At its best, you feel like you could ride forever. I met a man in Mortlach who said he’d gone 247 kilometres on a good tailwind. Still, most importantly, I never gave up. 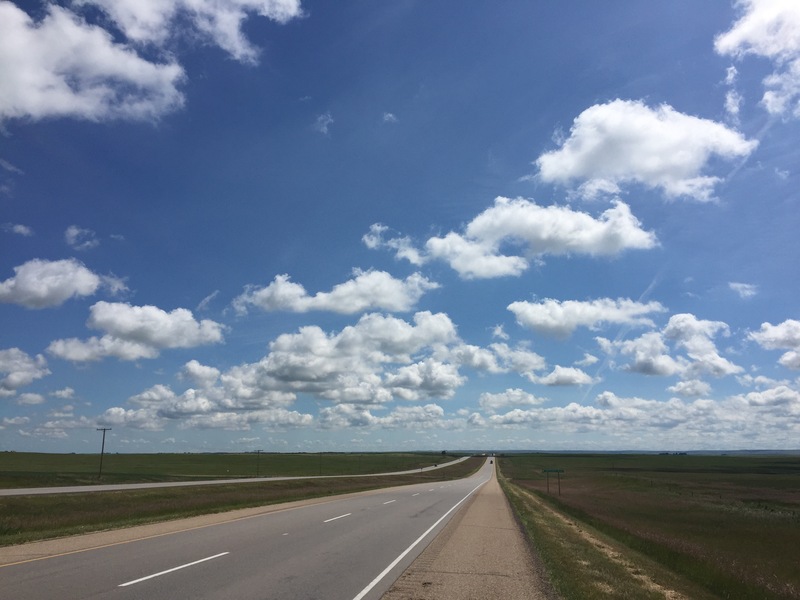 That struggle through headwinds and rain led to a revelation, too; as I pedalled through that desolate stretch of the Trans-Canada, it dawned on me that the most important thing we have is each other. More than shelter, food, or anything else, I longed for company in that moment. I won’t take it for granted in the future. 2. Prairie dogs are fun. It’s remarkable how close you can get to them on a bicycle before they scurry away and poke their heads up somewhere else. Regina: Technically “Floreat Regina,” but I prefer this. 1. Fields as far as the eye can see. My host in Bassano, AB told me I was cycling through the Prairies at the best possible time: right when the canola was blooming. She was right: the fields of yellow have added a vibrant splash of colour to the otherwise green surroundings. My first time in the city was a good one. The Wascana Centre is a beautiful area — the only shame is that the Saskatchewan Legislative Building was undergoing renovations. Here’s a look at the aforementioned Qu’Appelle Valley. Prairie dogs spotted: Too many to count. Saskatchewan Roughriders paraphernalia spotted: Same as above. When you’re on a bike for hours on end, you have plenty of time to think. 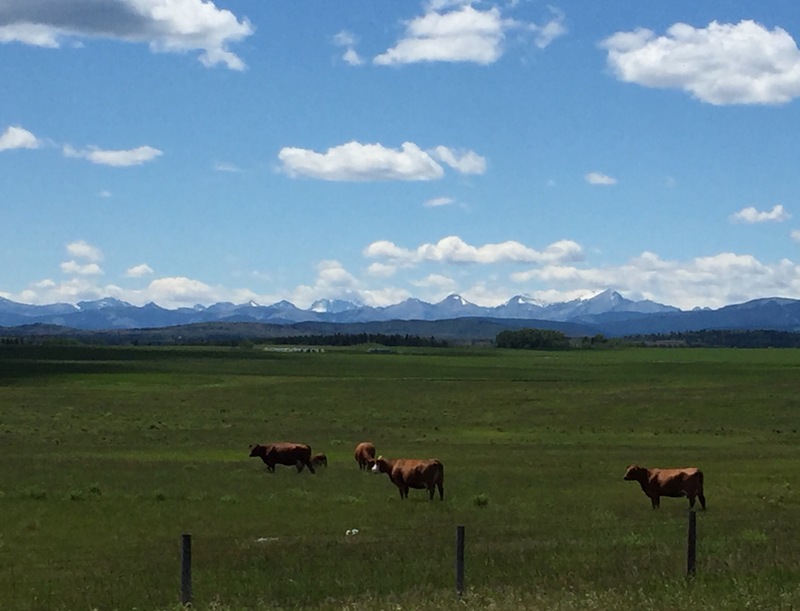 Now that I’ve made it to Calgary and beyond, my thoughts often return to one thing: sheer amazement at having travelled all the way from Vancouver on a bicycle. It’s hard to put to words the feeling of empowerment that brings. In some ways, the start of the ride feels like yesterday; in other ways, it feels like ages ago. I’ve changed — into a cycling machine, for one thing, but also into a more patient person. Trips that would take an hour by car require a day’s work by bicycle. In short, you can’t rush your way across the country. 1. On the topic of taking things slowly, I arrived in Bassano on a Sunday afternoon and was reminded of the pace of life in smaller towns. In all directions, shops were closed for the day — the only businesses open were hotels and motels. This presented a challenge, as I was hoping to catch Game 7 of the NBA Finals. Thankfully, my hosts obliged my addiction passion and found the game on TV for me. 2. On the opposite end of the speed spectrum, oh, how good it feels to fly down the road. After ten days of climbing through mountains, I’m fully enjoying the stretches of going 30+ km/h for hours on end (or, at least, when the wind cooperates). They’re not just limited to British Columbia; that’s for sure. The ride from Golden to Banff (and Banff to Calgary) takes you through plenty of mountains — I even had snowfall on the road. Because of my schedule, I missed out on some of the more iconic views from Lake Louise and Moraine Lake, but I did catch the famous Three Sisters. 2. Old memories made new. I stayed with family friends in Calgary — ones I hadn’t seen in over half a decade. Not only was it a chance to reconnect with them; it was also a chance to rediscover a city that captured my imagination 15 years ago and hasn’t let go since. For my 9-year-old self, the pinnacle of that first Calgary experience was seeing the Calgary Tower. To see it again brought back a flood of old memories, long-forgotten. My hosts in Bassano took me sightseeing to the town’s dam to catch the sunset – my first of the Prairies. It didn’t disappoint. 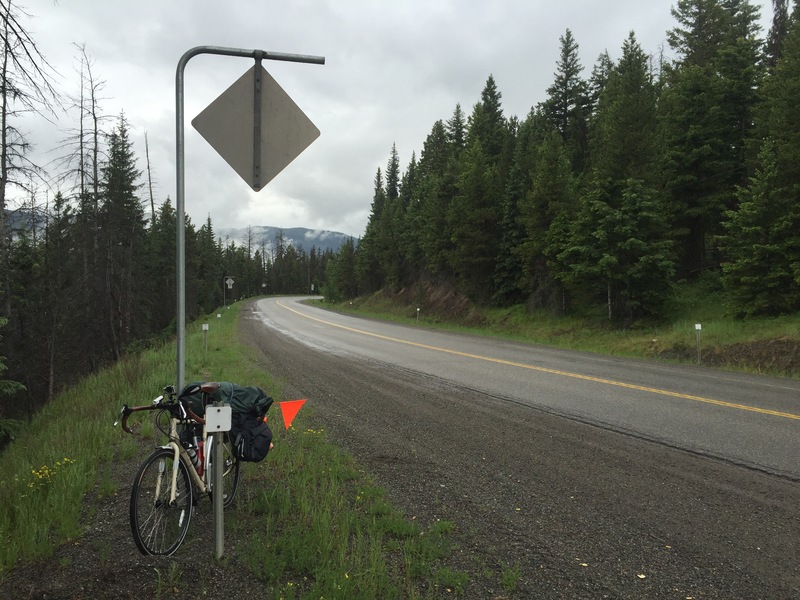 For a bike ride across Canada, the mountains are a hell of an initiation. I puffed and panted enough already with the Hawkesville hills, but Allison Pass is a different beast altogether: 1,342 metres above sea level. (Maybe there is a mountain high enough.) It kept going from there: first, Sunday Summit (1,282 m), then Rogers Pass (1,330 m). Many times, I was ready to stick my thumb out and hitchhike to the next town. Many more times, I wished I had a motor on my bicycle. Still, each time I kept on pushing. i) I connected with a man from Victoria, BC named Tim through Twitter — he had seen I was cycling through the province and wanted to know more. When he learned about the fundraiser for mental health, he told me he wanted to make a donation, and he said he’d meet up with me when I passed through Hedley. Sure enough, as I rolled into town the following day, he was waiting at the side of the road, donation in hand. ii) I met a man in Vernon named David as I was locking my bike up at the grocery store. He asked me where I was headed to, and when I told him about my ride, he offered to do what he could to find accommodations for me in Sicamous that night. As I arrived in Sicamous later that morning, I checked my phone and learned he had called the Best Western in town and told them my story — they were offering a free room for the night. Two days later, he did the same in Golden — the Prestige Inn offered a place to stay. The kindness of people is overwhelming. Kind of a given in a post about cycling through the mountains, but still, wow. I saw them in the distance on my first day of riding, but they really started to come into view on Day Two. By Day Three, I was right in the thick of them. The Okanagan region is a national gem: shimmering blue lakes, surrounded by rows upon rows of vineyards, framed by dramatic cliffs. The Shuswap area is beautiful in another way: the picture of cottage country. My favourite combination. The ride from Sicamous to Revelstoke is full of them, each more impressive than the last. Four days. It’s been 96 hours and counting since I set out from Vancouver to St. John’s with nothing but two wheels and my own strength to get me there. I’m staying the night in Princeton — the kind of town where the grocery store cashier knows you’re not from around the way because she’s never seen you before. Still, in a town of less than 3,000, it’s amazing how close to home you can get: the man behind me in the checkout line spent his teenage years living in New Hamburg. It was the rain that brought me here — ironic, because Princeton is known as a generally dry and sunny place. (Ironic, too, because mere hours after my drenched arrival, the warm sun returned.) The rain has followed me since I arrived in Hope, often no more than a gentle drizzle, but today, a chilling rain — the kind that gets under your skin and begs for a warm shower and a bed. It’s been a year since I returned from my last adventure. I’ve missed the freedom of endless opportunity and the constant sense of wonder. Last time, it was all planes, trains, and automobiles. This time, it’s a little more challenging of a journey — but with challenges come rewards. I met a fellow cyclist already: Evan, from Meaford, Ontario. 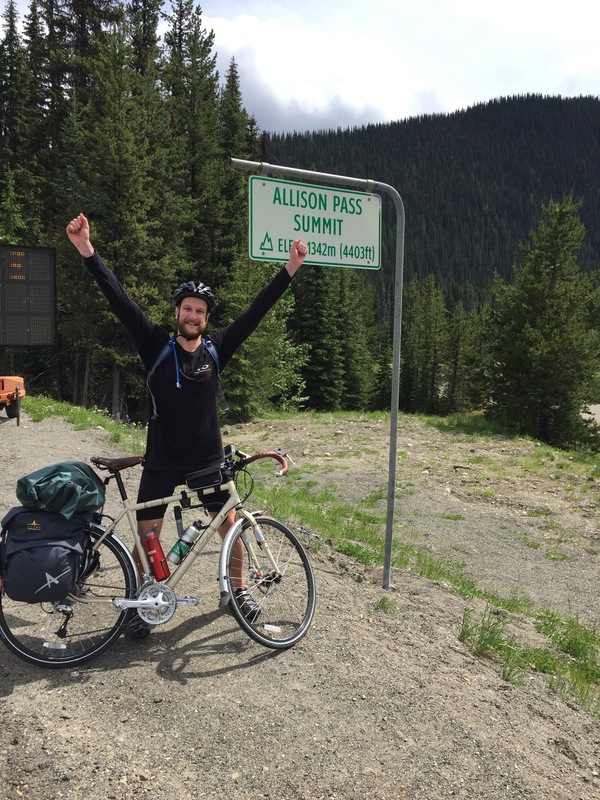 We crossed paths on Day 3 and conquered Allison Pass together before going our separate ways. It’s amazing what a difference the company of others can make when you’re alone on the road. I hope it’s the first encounter of many — with Evan, and with other cyclists and hosts. For now, it’s just me, my bike, and the road. 2. I’ve got a ways to improve in this whole “camping” thing. On my first night, as I went to attach my borrowed mini stove to the propane tank I’d bought, I realized it didn’t fit. Lesson learned: sometimes it pays to sweat the details. Lots of highway shoulders and passing cars, but thankfully, some moments of wonder in between. This one came as I travelled down the Lougheed Highway towards Mission. I followed a railroad track for a good stretch of the ride, and several times past Maple Ridge, the road skirted the edge of the Fraser River. Right around this moment, I was so desperate for a swim, I was ready to hop in the water. As I looked for something to do in explored Princeton, I came across this view looking over the Tulameen River. When the rainclouds part, it’s a pretty beautiful place. Bears spotted: Just one, and it was Smokey Bear telling me “Only You Can Prevent Forest Fires.” Unexciting, perhaps, but also probably safer that way. Tomorrow, I hop on the bike for the start of a 7,500 kilometre cross-country adventure. For all the excitement to come, it’s remarkable how close the trip came to a grinding halt before it even got off the ground. Perhaps unsurprisingly, the answer was yes — only the clerk hadn’t deemed it important to mention until that very moment. I was that close to having my only source of transportation being whisked away into the bowels of Pearson Airport with no name or address attached. I think I did a little too much walking around Vancouver in my first two days. By day three, I was dealing with some discomfort, and by day four, the pain was really setting in. Hopefully cycling will offer a different range of motion from walking and the pain will recede. Timing feels like more than coincidence sometimes. I was taking a Friday morning tour of UBC led by a friend, and we passed by the campus radio station, CiTR — the very place where Nardwuar (one of my greatest influences in music journalism) broadcasts his shows. On a whim, I checked to see when Nardwuar’s show broadcasts live — Fridays at 3:30. What are the odds? I stuck around, and sure enough, he showed up as 3:00 approached. After I introduced myself, he offered to show me around the campus radio station, and we chatted about the similarities between CiTR and my experience at CHRW — proof that when you put two music nerds in the same room, they’ll get along just fine. It wouldn’t be Vancouver without rain, would it? I arrived to sunshine and clear skies, but — like clockwork — the clouds rolled in as soon as I set out to explore the city. A quick aside on the Vancouver rain: it says something about a city when you can buy umbrellas out of vending machines just about everywhere. Vending machines. Thank goodness I’ve had good weather. The park is massive. It took a good four hours to walk around Stanley Park’s seawall, and that only scratched the surface of the park’s 400 hectares. Special highlights: basking in the beauty of the forest’s endlessly tall trees, lounging at the English Bay beach, and admiring the handiwork of the park’s towering totem poles. It’s been fun exploring Vancouver and revisiting things I’d seen years ago with family. Some things — like Stanley Park — I remembered well and couldn’t wait to see again. Other things — like the Lonsdale Quay in North Vancouver — I’d totally forgotten about until returning to the same spot.